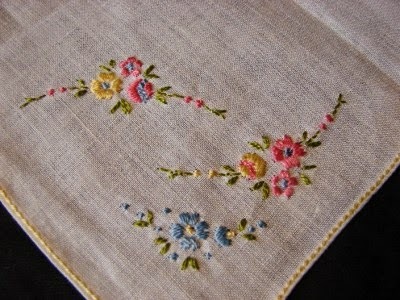 Firstly you need to go hunting for vintage tablecloths and napkins that have pretty embroidery on them, this is a great fun part of this I always find. You may be lucky enough to have inherited some and you really do not use it, so making them into something that you will use is the way forward. You need to wash and press them. If you have some yellowing or stain then you can try this little trick. Squeeze some fresh lemons. Then put an old towel down on the table and position your cloth on top. Add lemon juice to the stains and then put salt on top and give it a rub. Leave like that for 30 minutes. Then put some white vinegar in some water and rinse in that solution. Then what I do is wash with a rose scented liquid soap to make it smell nice. Finally give it a very good rinse. Then dry and press. Make a template for your bunting from card or you can buy a template ( quilting ones). Draw around the template positioning carefully to incorporate the hand embroidery, two triangles per flag. NOW.... You can do one of two things. Cut out directly on marker line and fray slightly. You can then sew two together (wrong sides together ) and sew those so they look distressed OR put right sides together and stitch around. Turn right sides out and press and then stitch around again leaving a 1/4 inch seam so it is more formal. The choice is yours. Then all you do is attach your flags to cotton tape. Buy the 2.5 cm width tape ( as much as you need for the length of bunting your require, not forgetting that you need extra for tying both ends). Fold in half and press. Then leave 20 cm for tying and place your first flag in the fold of the tape, secure with pins. Leave a gap of say 7 cm and place another flag and pin it....... keep going until you have the length your require, remember to leave a 20 cm length of tape at the other end as well. Then all you do is starting at one end, stitch along the open edge of the folded tape all the way to the end, thus closing the tape and attaching the flags securely along the way. Continue right to the end of the tape. Give it a go and Happy Stitching! You could add some vintage buttons as well!